Indonesia was a Dutch colony for several hundred years. Dutch traders exported exotic agricultural products throughout the world from what were called the East Indies or the Spice Islands. Indonesia was occupied by the Japanese during World War II, but the Indonesian resistance movement eventually defeated them after great sacrifices. The Indonesian people were determined to make their own future as an independent nation rather than as a colony of the Netherlands. 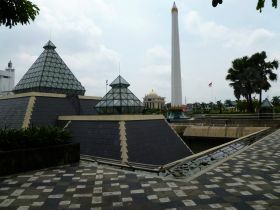 Using the caches of weapons that they captured from the Japanese, the Indonesian fighters seized the Hotel Yamato that housed the Dutch military headquarters in Surabaya. The fighters brought down the red, white and blue Dutch flag, tore off the blue stripe and raised the remaining red and white flag which became the Indonesian flag. The hotel still stands and has been renamed Hotel Majapahit. Having fought the Japanese, the Indonesian people then had to fight the Allied Forces that wanted to return the land to colonial rule. After British Brigadier A.W.S. Mallaby was killed, the British forces issued an ultimatum demanding all Indonesian fighters to surrender unconditionally. When they refused, the British launched a punitive sweep under the cover of aerial bombardment. Although the Indonesian forces suffered heavy casualties, their efforts increased popular support for independence. Indonesia declared independence in August of 1945, but fighting continued against the Netherlands until 1949 when the Dutch government officially acknowledged Indonesia's independence. Indonesia received military aid from the Soviet Union in 1962. 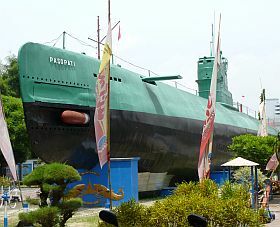 The decommissioned Russian submarine "Pasopati" now stands in a park in Surabaya as a memorial to Indonesia's determination to remain an independent nation. 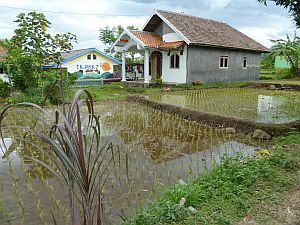 Today, Indonesia is an amalgam of the country's traditional agricultural roots combined with an influx of modern technology. The electricity in Indonesia is 220 Volts at 50 cycles per second, with European-style round sockets. 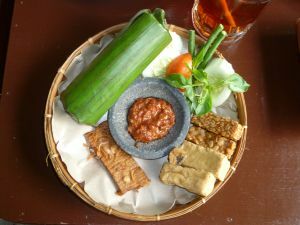 The countryside has abundant rice paddies, fruit trees, and farm animals, but even in the middle of a large city like Surabaya you can hear roosters crowing among the constant buzzing of motorcycle motors. 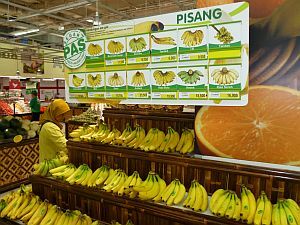 Shopping centers offer a selection of electronic products comparable to the United States, and the large grocery stores have a broad range of packaged products and fresh produce. Cellular telephones are abundant and, like in the United States, teenagers always are busy texting or calling their friends. Indonesia has approximately 238 million inhabitants scattered among 17,508 islands. The majority of the Indonesian people are Muslims, but they get along well with other religious minorities. Throughout the day, and as early as 4 AM, you will hear the calls to prayer issuing from the loudspeakers of a multitude of mosques. As you travel through the countryside, you see a variety of domestic animals such as ducks, geese, chickens, goats, cats, and even some cows, but you will not see pigs and you will only rarely see dogs because Muslim traditions consider these animals unclean. The chickens are generally free range and they dodge cars and motorcycles to survive. Unlike the American chickens which are plump, Indonesian chickens are thin and wiry. 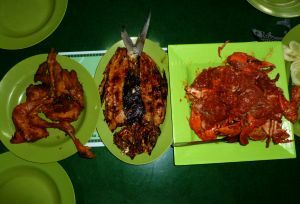 A grilled chicken looks quite scrawny by American standards and the meat is tougher. There are no bars in Indonesia because alcohol is forbidden by Muslim rules. Alcoholic beverages can be found in the island of Bali because it has been developed as a tourist zone, but Bali is not really representative of Indonesia. 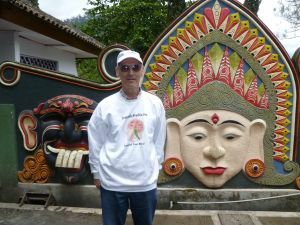 More than ninety percent of Bali's 3.9 million residents are of Hindu origin and practice Balinese Hinduism wheras the majority of Indonesia follows Islam. 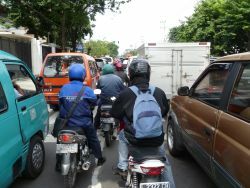 Vehicles travel in Indonesia on the left side of the road. Approximately two thirds of the vehicles on the road are motorcycles, and the rest are cars, trucks, and bicycles. Motorcycles swarm from all sides of the road. When a traffic signal turns red, the motorcycles squeeze through the spaces between the lanes to get as close to the intersection as possible. The lights at the intersection display the number of seconds remaining for the light to change. Red numbers indicate the number of seconds remaining for the "stop" signal and green numbers for the "go" signal. There is no yellow light, the second timers give you warning. It is really amazing how the traffic moves smoothly enough although vehicles are zooming within a few inches of each other. Many of the motorcycles carry an extra passenger and sometimes also a commercial load. It is not unusual to see a family of three on a motorcycle. Both motorcyclists and car drivers make frequent use of the horn. A short beep means "careful, I am here" and keeps other drivers from hitting you. A long beep means something like "get out of my way, here I come". 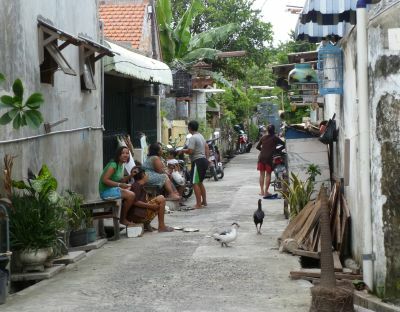 Even in big cities like Surabaya, many houses are located in alleys that are too narrow for a car. People who have cars park them along a wide street and then walk home. Almost every home has a porch where one or more motorcycles are parked. A motorcycle is the vehicle of choice when you need to run a quick errand because it can maneuver through traffic more easily. Driving along the highways, I noticed that the grass was neatly trimmed along the sides of the road. There were people using hand scythes to trim the grass. At first, I thought that these were people hired by the government to keep the highway neat, but later I found out that these were local farmers cutting grass as fodder for their farm animals. This is a win-win situation where road maintenance provides farm necessities. If you travel to Indonesia, do not bother to carry traveler's cheques. They are virtually impossible to cash. During my visit in January of 2011, I went to six different banks trying to exchange a $100 American Express traveler's cheque. No deal. In one of the banks where I tried to exchange some money, I was told that they were required by American Express to call to verify every transaction. However, the telephone number where they were supposed to call was always busy, and they were sorry that they could not cash or exchange the traveler's check. The clerks were very helpful and suggested that I try Citybank. I stood in line for the Citybank teller behind an Indonesian woman who was doing some transaction where she flashed two thick stacks of brand new $100 Dollar bills. I estimated that she had about $100,000 Dollars in her purse. I had decided by this time that since it was so much trouble to exchange the traveler's check, I would at least convert $200 or $300 Dollars, but I was told that they would only exchange the money for Citybank account holders. Since I did not have a Citybank account, they were sorry that they could not help me, but suggested another bank. After going to other banks and a money exchange agency, I gave up trying to exchange the traveler's cheques. I eventually ended buying what I wanted by charging it on my Visa debit card because, for some reason, the transaction for my Visa credit card required a PIN. The American Express company advertises that you should not to leave home without their traveler's checks, but in Indonesia you are probably better off carrying cash and hiding it in several places on your person or in a money belt . However, make sure that you carry brand new bills. You will have trouble cashing old, marked or wrinkled bills. Indonesia is an archipelago located along the "ring of fire" which is one of the most volcanically active regions of the world. 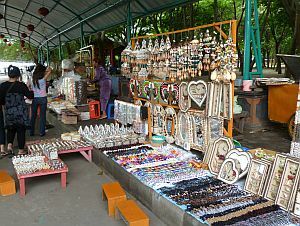 The 2004 tsunami that caused over 230,000 deaths in fourteen countries is still fresh in the memory of the inhabitants. 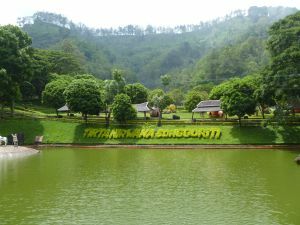 The tsunami was triggered by an earthquake off the coast of Sumatra, which is the largest Indonesian island, and it also is the island where lake Toba is located. Lake Toba is the water-filled caldera of a supervolcano that almost extinguished humans as they were emerging from Africa 74,000 years ago. The volcanic activity of the area is also evident in the island of Java where Surabaya is the largest city. Clouds of volcanic ash occasionally affect air traffic. Approximately 50 kilometers from Surabaya, in the East Java district of Sidoarjo, there is a mud volcano that spouts steam and mud every ten seconds like a geyser. The mud from these eruptions has already buried four villages and threatens several others. 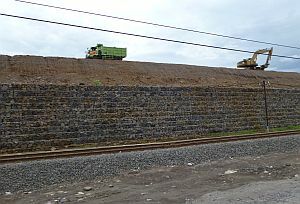 A levy has been built to protect the neighboring communities, but it is possible that the volcano will eventually win. The mud volcano is an environmental disaster caused by careless exploration for natural gas. 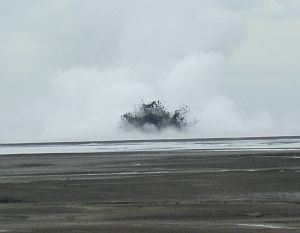 When some of the rock fractured during drilling in 2006, there were no containment sleeves in place, and the hot water and mud started spouting. All attempts at plugging up the hole have failed. 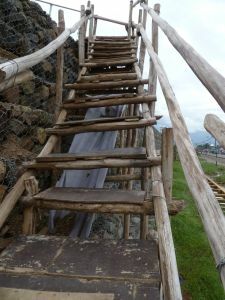 There have been some efforts to turn the area into a "tourist attraction" by rigging some bamboo stairs to the top of the levee. From Surabaya, you can take a day trip to climb the active volcano Mount Bromo. 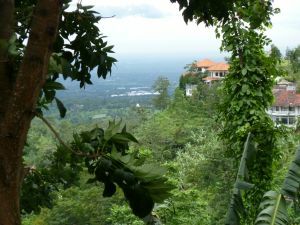 The city of Batu is located in the mountains about 100 kilometers from Surabaya. 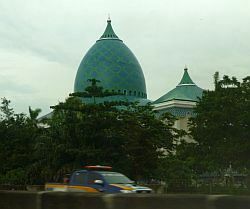 Surabaya, which is at sea level, has a tropical climate, but the climate in Batu is cold because of the high altitude. You will need a coat or heavy sweater and you will also need an umbrella or a raincoat because it rains frequently. 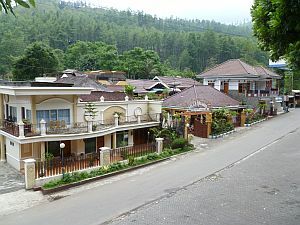 Batu has a large number of guest houses where you can rent rooms inexpensively. 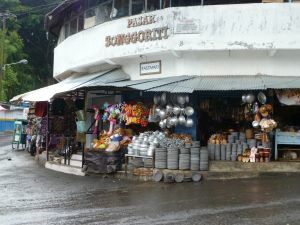 Some of the side streets are lined with shops where you can find souvenirs, snacks, live rabbits, sandals, mortars and pestles carved from stone, and local crafts. Batu also has a an amusement water park that features mythical characters and cement sculptures of dinosaurs. 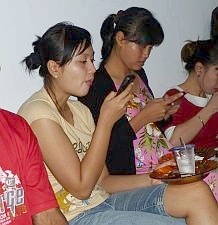 Indonesians like their food spicy. Food is normally eaten with the hands, rather than with a knife and fork. Soup, of course, is eaten with a spoon. 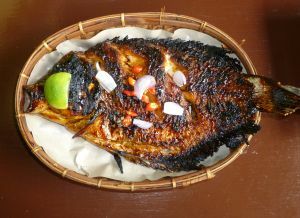 These are some dishes that you are likely to encounter in the restaurants. 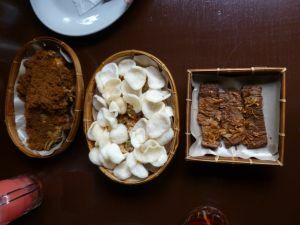 Krupuk (fried shrimp crackers), sate (grilled skewers), and tempeh with rice wrapped in banana leaf. Extended families may live close enough to each other to visit frequently, sometimes several times per day. It is customary to leave shoes or slippers at the threshold and walk barefoot at home. The glazed ceramic floors are kept very clean by mopping, and the areas of heavy traffic are swept frequently. 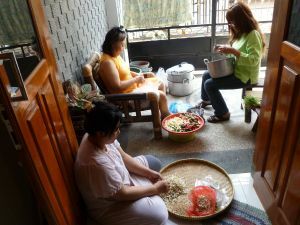 For celebrations, members of a family get together to prepare food, and then they share the cooking duties once all the ingredients have been prepared. The food preparation may involve washing, peeling and slicing vegetables, as well as cutting and marinating meats. 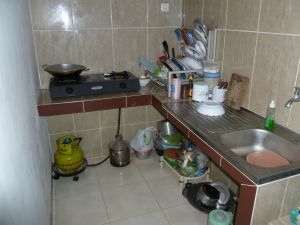 The kitchens in Indonesian homes are small and usually have only a two-burner gas stove connected to a 3-kilogram bottle of liquefied petroleum gas (LPG). This size is subsidized by the government for home use to reduce the hazard of fires and explosions posed by kerosene stoves or bigger tanks. 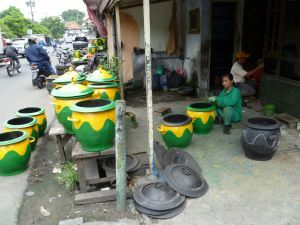 These stoves are sufficient to prepare the soups, stir fries, and stews that are the primary dishes of Indonesian menus. Since ovens are not available at home, baked foods are usually bought at bakery shops or grocery stores. Dishes are hand-washed with cold water and placed on a rack to air dry. The United States and most European countries have high standards of sanitation. Travelers in the United States expect toilets in gas stations or restaurants to have flush toilets, and provide toilet paper and hand washing facilities. In Indonesian restaurants, you are not likely to see toilet paper or flush toilets. Instead, there is a cistern filled with water and a dipper that you can use for pouring water on your buttocks so that you can wash yourself. Frequently, there is a towel hanging in wall that you can use for blotting up after washing, but this does not seem very sanitary since you don't know who may have used the towel before. It is better to drip dry and let your underwear absorb any remaining moisture. The dipper is also used to pour water into the toilet to activate the syphoning action and flush it. You can expect the floors and toilet seat to be wet from the scooping of the water for cleanup and flushing. The toilet bowl is set on a concrete or tile platform about six inches from the floor, which has a drain. In the homes, people bathe by scooping water from the cistern to pour over their bodies. There is no hot water. 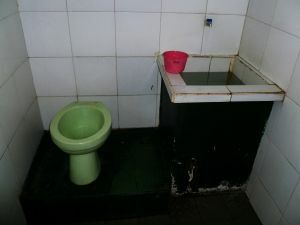 The hand washing facilities for restaurants are usually in an open area outside the toilets and they have soap and water, but the soap is a bar soap that may have been handled by many people. The adage "waste not, want not" applies very well to Indonesian commerce. As you travel around a city like Surabaya, you notice little shops that take broken products and repair them for further use. 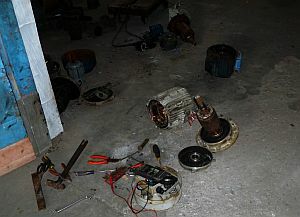 Burned out electric motors are reconditioned by disassembling them and replacing the bearings, removing the old wiring from the armature, and replacing the wire by re-winding the armature manually. Such rebuilt motors will sell for about one third the price of a new motor, but this is possible only because of the low cost of the labor. Worn-out automobile tires are recycled into colorful trash containers by turning the tire inside-out so that the threads are on the inside, and then attaching a bottom and handles. The lids are also made from the tire materials. As a final touch, the containers are painted with colorful designs. Tires are recycled into trash bins and the armatures of burned-out motors are rewound. 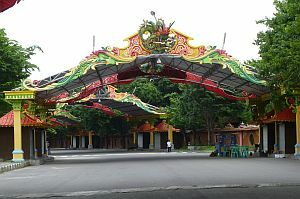 Kenpark Pantai Ria is an amusement park located in the North Surabaya area. The main attractions are a swimming pool, horse riding, fishing lake, playground, a roller skating hall, a hotel, and restaurants. The park also has a race track that is used for special events. 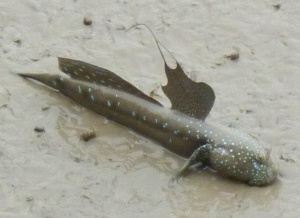 The park is adjacent to a coastal tidal mud flat where Blue-spotted Mudskippers (Boleophthalmus pectinirostris) forage and raise their dorsal fins to keep intruders away from their territory. 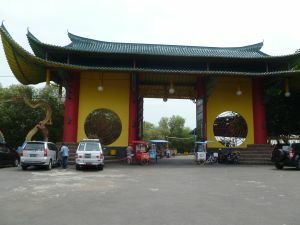 Gate of the Chinese complex and a souvenir stand. Chinese zodiac arch over the road. as it crawls over the mud at low tide. The island of Madura is separated from the island of Java by 5.4 kilometers. 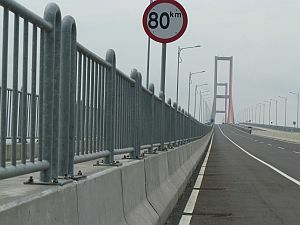 The Suramadu Bridge was opened in 2009 to connect the two islands and stimulate commercial development of Madura by connecting Surabaya in Java with the town of Bangkalan on the island of Madura. Previously, automobiles could only reach the island using ferry boats. 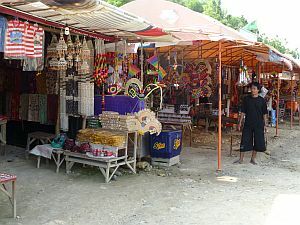 Souvenir shops and tents with snacks line the roadway near the bridge. I am very thankful to Julius, who drove me around the island of Java and the city of Surabaya to show me the real Indonesia. The picture below was taken on the grounds of the 10th of November Museum, which celebrates the start of the struggle for Indonesian independence. The graffiti is part of the monument.